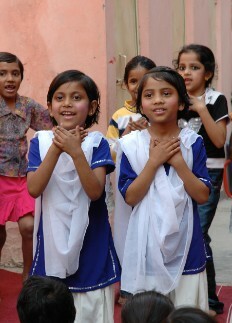 Anurag Society is a non-profit organization that is changing the lives of women and children in an impoverished part of New Delhi, India. Anurag ((pronounced ah-noo-rahg) started in 1990 with 25 children. Now, through education and other services, Anurag is bringing hope and a future to more than 1000 women and children. Enrolled in the various Anurag programs are children from the ages of 12 months to adults nearing 80! Anurag offers a day care facility for infants and toddlers, Primary School, after-school program for children, a government-recognized sewing and tailoring school for young adults, computer courses, adult literacy programs for women, and a healthcare clinic. Anurag serves over 1,000 women and children every day. It employs 103 staff members, mostly women from the community. The work of Anurag is changing countless lives with nothing more than hard work, personal sacrifice, and a belief in "eternal love".